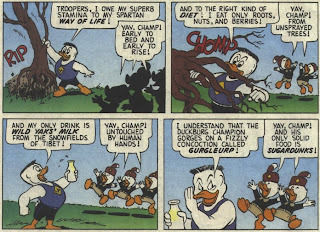 Duck Comics Revue: "Bubbleweight Champ"
You have heard it said that Barks became dispirited in the sixties, but I say unto you, nay, he did some very good stories at that time. However, then you present "Bubbleweight Champ" as a counterargument, and I am forced to concede defeat. Alas! I slink away in humiliated silence. I think Barks' ten-pagers at the time suffered rather more than his longer Scrooge adventures. A LOT of his shorts at the time are quite sour, but of all those that I've read, none tops "Bubbleweight Champ" in this regard--it reads like something written by a very, very depressed man. Whee! 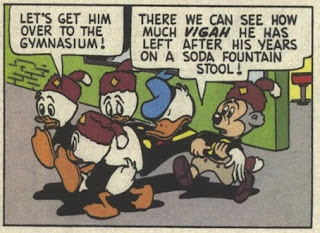 It's Carl Barks' L'Assommoir! If you've ever wanted to see what Donald would be like as an alcoholic, then what the hell am I saying? No one has EVER wanted to see that. But brother, you will get it here--start to finish. I'm actually sort of surprised the censors let such not-so-subtext get through--and in this case, I would actually kinda have been on the censors' side, because this is just...awful. Throughout the entire story, Donald is never, ever portrayed as anything other than a complete, barely-functional lush. "Years on a soda fountain stool." So we're implying, even, that he's always been like this. Why, Carl, why? Barks' second wife was an alcoholic, you know--a violent alcoholic, apparently, who would try to destroy his work. I don't know if that informs this or not, but it certainly could at least partially account for the grimness of tone. So who does Donald have to compete against? "Boldan True" is this fellow's name, and if you imagined that, perhaps, he would present some sort of positive contrast to Donald's drunkenness…well, as you can see, not so much: he may be tough, but he's also unpleasantly full of himself and his vaguely suspicious, hyper-organic lifestyle. Yup, the Gurgleurp and Yaks' milk got mixed up. No glory; no nothing. A totally empty prize. Donald goes back to drinking, delusionally full of himself, and the kids just feel hollow. Christ, Carl, were you trying to drive kids to drink, or what? Maybe retirement wasn't such a bad idea. WOW. I've never read this story before...what a bizarre comic! I quite enjoyed this story as a kid. The veiled alcohol abuse might seem depressing to adults, but for kids it's just a silly story. :) Doesn't "Wild Yaks' Milk" sound positively disgusting? Yuk! Just dropping by to say I enjoy reading your blog. You did some pretty astute observations, especially about Gladstone and Flintheart. Thank you! I appreciate that. And you're right; it certainly WOULD go over your head if you were younger. I never read this one as a kid, and it would be interesting to know how that would have changed my current reaction. Anyway, more coming...approximately right now. "Days at the Lazy K"
"The Duck Who Never Was"